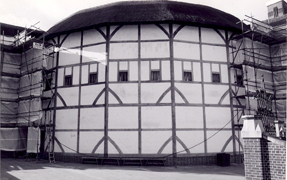 The Globe Theatre is a faithful reconstruction of the open-air playhouse designed in 1599, where Shakespeare worked and for which he wrote many of his greatest plays. 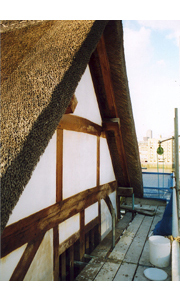 Located on the banks of the Thames River in London, the theatre was lime rendered in the early 1990's. 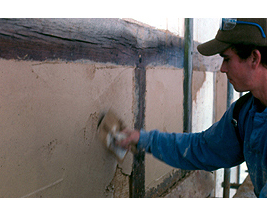 Some of the original panels had performed poorly over the years resulting in a contract with Crocker Ltd to perform the requisite repairs in the year 2000. 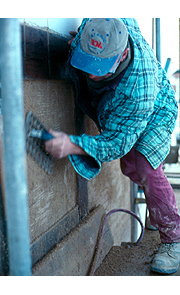 Crocker Ltd's crew, led by Pete Mold, removed the failed panels, re-established the wood lathing system and re-applied the lime mortar. Repaired panels in the gable over one of the entrances. Finish work on the lime mortar.